Antenna lines said to disappear on the Apple iPhone 7; camera will lie flush with rear panel? When images first starting surfacing of the Apple iPhone 6, many fans were upset to discover that visible antenna lines could be seen on the back of the handset. With the antenna lines, the iPhone 6 somewhat resembled the HTC One (M8) from the back. At the same time, the design featured a protruding rear camera, the bane of many an iPhone fan. Now, a new design is due with the arrival of the Apple iPhone 7, and there is talk that the next iteration of Apple's iconic smartphone will launch with most of the antenna lines gone from view. Even better from the standpoint of many fans, the protruding camera will be replaced with a rear shooter that will lie flush with the back cover of the handset. Ironically, this rumor starts spreading on the same day that a report is disseminated about a flush rear camera for the Samsung Galaxy S7. Even though those looking at the new model won't be able to spot the antenna lines on the rear panel, that doesn't mean that they will have been removed from the handset. It is possible that the lines will just be covered up. In addition, some antenna lines will still be visible on the top and bottom edges of the iPhone 7. Overall, the iPhone 7 will supposedly look like the Apple iPhone 6s, which in turn looks like the iPhone 6. Minus the 3.5mm earphone jack, the new iPhone could be thinner, sport an IP certification for waterproofing, and feature a higher capacity battery. The larger Apple iPhone 7 Plus could be equipped with dual cameras on the back. 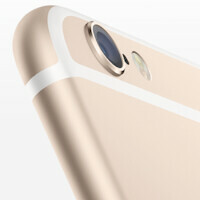 The second camera would handle optical zoom, according to connected Apple analyst Ming-Chi Kuo. While Apple is said to be holding a media event in the middle of next month to unveil the rumored 4-inch Apple iPhone 5se, the Apple iPad Air 3 and a refreshed Apple Watch, the iPhone 7 and iPhone 7 Plus might not see the light of day until Apple's usual September unveiling. Cam being flat is a copy from the Huawei P8!! Uh the iPhone camera has always been flat up til the iPhone 6/6S series, so how is the camera being flat copying samsung/sony? If the camera is not protruding from the iPhone 7, it would just be Apple going back to having it flush like in the past, where as samsung has always had a protruding camera. Try trolling harder. artificialintelligence, I never had iPhone, but I see my colleagues at work using it. They have always the display brightness around 40-50 percent at all time to be able to go through the day. How about you? Do you do this too or you have it on %100 brightness all day long? My experience with my GS6 Edge: I personally set my phone's brightness manually at %100 all the time and I always have about 35-45 percent battery before I go to bed. I just want to mention that I don't play any games on my phone, but watch videos and news coverage during the day. Does your iPhone do the same? I am just curious. Anecdotal evidence doesn't mean much because my experience is the exact opposite. I have my iPhone screen on lower brightness because I don't want to burn my retinas to read small text on a white background like on this page, it would be the same whatever phone I use. I never go to bed with less than 30-40% battery on my iPhone 6 yet the only person I know with a GS6 Edge has to charge it by early evening and she turns off Wi-Fi and Bluetooth because it's such a problem. I don't care what fanciful test results show (it's not like certain companies haven't cheated at them anyway) because my "real world" experience hasn't been the same. A phone is smart also because it does stuff the user doesn't have to, like adjusting the display brightness according to the ambient light. He said signal hunters. He said nothign about battery-life. Decent battery-life isn't equal to excellent battery-life. My phone last 2 full work days on a single charge. I am positive no iPhone model does. iPhone 6s has a great battery life, especially considering its smaller than most phones. You must have pretty low standards in battery life to call it "great". A day or a day in a half most of the time is low standard? Mind you I play RR3 and AfterPulse all the time. Yup, still pretty darn low. Now imagine if they made the iPhone 6S around 8mm-9mm thick with a much bigger battery, wouldn't you love that? But no, Apple is still sticking with the stupid thinness trend, unfortunately other OEMs are following. Oh, I have no argument with you about that. The devices are thin enough, too thin if your camera bulges out. LOL. He's a fanboy. Fanboys have no standards. HAHAHA... Do you really mean "great" or "crap"? Try out the Huawei Mate 8 and then talk about battery life! Its very similar in size with 6 plus despite having 6in display. Now if you think 6 plus is big as iPad then thats another issue. Now we know what to look forward in note6. Any bets? The rumors for Samsung camera suggest that it will be .8mm thick - that is not flush!!! It's actually thicker than iPhone 6/6s. Flush has nothing to do with thickness, it means there is no protrusion of the camera from the body, in other words it does stick out, it's flush. Sorry, didn't see you were only referring to the camera, not the entire body. iPhone 3G, 4, 5 all had flush cameras too, as did many other phones dating back to when cameras were first put into phones. Don't be so retard. Guess camera humps are big deal when carrying your phone naked. Never had a problem with them myself. I use a case always. Most every naked phone I see has spider webs across the screen. These gadgets cost too much to risk breaking.